Goodspeed Update | How Open are Massachusetts Municipal Data? Increasingly, citizens are demanding access to raw data from governments to hold public officials accountable, look up facts, conduct analysis, or create innovative applications and services. Cities and towns create data using geographic information systems such as layers describing parcels, zoning, and infrastructure that are useful for a wide range of purposes. Through a public records request to all 351 Massachusetts municipalities, this paper investigates whether these data are accessible to citizens in practice. Some response was received by 78.6 percent of the municipalities. Two municipalities refused access to all electronic records. Many others charged fees ranging up to $453 or placed legal restrictions on the data through licensing that could chill or prohibit creative reuses of the information through emerging technologies. Other practical barriers limited public access to data, such as limited resources, government officials’ limited technical knowledge, and outsourcing to private vendors. A followup survey among municipalities that did not respond to the request was conducted to determine if they had GIS systems or data policies, and this information was collected for 80.3 percent of the municipalities. Finally, the paper discusses the legal, policy, and technical steps that can be taken by governments to move from a “public records” to an “open government” paradigm for transparency of government data. The policy recommendations for municipalities include publishing GIS data for free online and with minimal legal restrictions. The paper started as a class project for the MIT class “Ethics and Law on the Electronic Frontier” I took in Fall 2010. This research is related to the work I did at the City of Boston, where in 2010 I developed an open government strategy proposing how the city could use technology to achieve transparency, participation, and collaboration goals. Goodspeed, Robert. 2011. 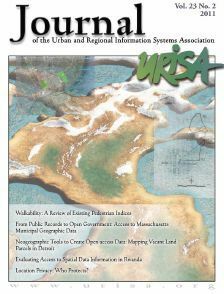 “From Public Records to Open Government: Access to Massachusetts Municipal Geographic Data” (PDF) Journal of the Urban and Regional Information Systems Association 23 : 1, p. 21-32. > What Government Data Should be Transparent? I haven’t read through it yet, but I’m looking forward to! As someone interested in the subject matter but currently without access to paywalled journals, I really do appreciate your decision to publish with an open access journal. Thank you, the link is fixed now. Rob, nice work, must have been a ton of time contacting that many agencies, well done! It will be interesting to see how well the UCGIS guidelines on data sharing take to trickle down to local authorities across the country. Given the myriad of responses you received and the usual variety of arguments for not sharing it makes a solid case for having some standardized state parcel databases and policies in place mandating access. It would be a lot of duplicative effort for ~300 towns to develop and build new policies and platforms for data sharing, but a state sponsored effort can share resources and coordinate the data. Now that the whitehouse has open-sourced the data.gov platform and the CKAN.org system is open there are some very easy, low cost ways for states to support their municipalities in this way, it just takes us making noise to get our leaders to step up and take the initiative!